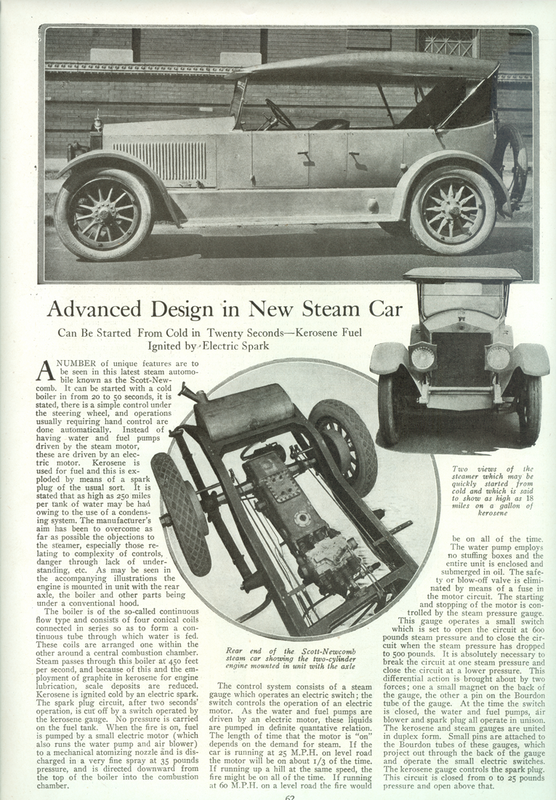 The Standard Steam Car was equipped wit a Scott-Newcomb 2-cylinder, horizontal kerosene-burning steam engine and was advertised as being able to raise a head of steam in less than 60 seconds. The car carried a Rolls-Royce-type condenser-radiator and closely resembled the then well-known Roamer. A touring model was the only body style available. It was sometimes known as the Scott-Newcomb. This article appeared in Automobile Trade Journal in July 1902 on pages 323 and 324. This photograph of the Scott-Newcomb steam touring car by Standard Engineering Co, St Louis, MO came from a paper dealer on eBay whom we only know as "Mark." He owned this article, but sold it. However, before selling it, he posted it Wkipedia. He believes it is in the public domain. Thanks, Mark! 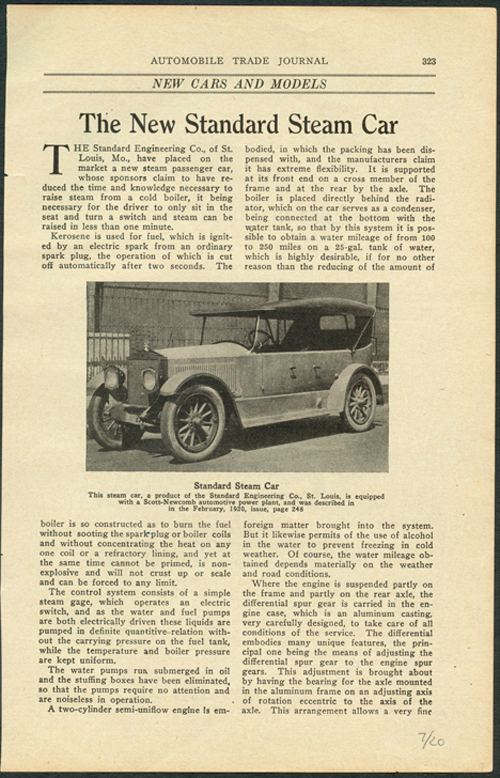 This Scott-Newcomb steam car article appeard in an unknown automotive magazine in 1920. 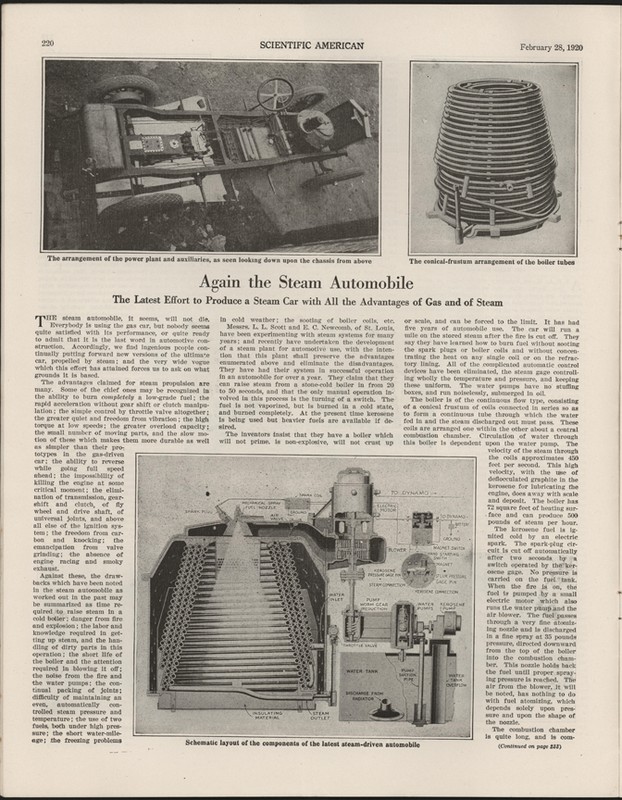 The February 28, 1920 issue of the Scientific American carried this article about the Scott-Newcomb Steam Car under the title Again The Steam Automobile. Georgano, G. N., Encyclopedia of American Automobile, (New York, E. P. Dutton & Co., 1968), p. 185. Email from "Mark" to Don Hoke, June 20, 2010.